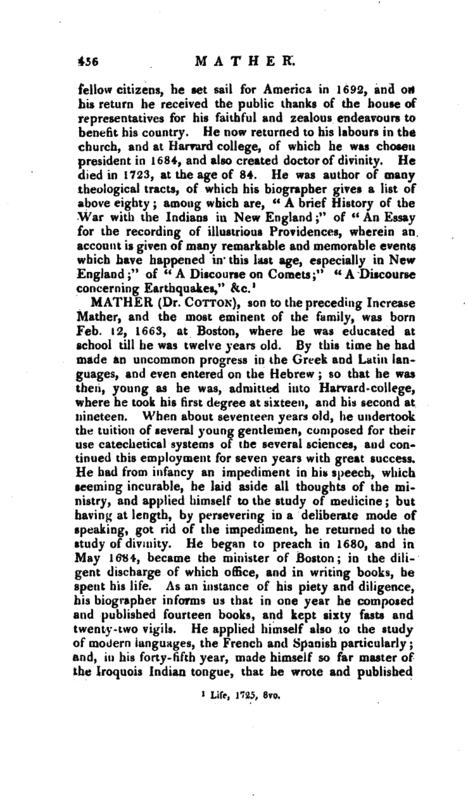 , son to the preceding Increase Mather, and the most eminent of the family, was born Feb. 12, 1663, at Boston, where he was educated at school till he was twelve years old. By this time he had made an uncommon progress in the Greek and Latin languages, and even entered on the Hebrew; so that he was then, young as he was, admitted into Harvard-college, where he took his first degree at sixteen, and his second at nineteen. When about seventeen years old, he undertook the tuition of several young gentlemen, composed for their use catechetical systems of the several sciences, and continued this employment for seven years with great success. He had from infancy an impediment in his speech, which seeming incurable, he laid aside all thoughts of the ministry, and applied himself to the study of medicine; but having at length, by persevering in a deliberate mode of speaking, got rid of the impediment, he returned to the study of divinity. He began to preach in 1680, and in May 1684, became the minister of Boston- in the diligent discharge of which office, and in writing books, he spent his life. As an instance of his piety and diligence, his biographer informs us that in one year he composed and published fourteen books, and kept sixty fasts and twenty-two vigils. He applied himself also to the study of modern languages, the French and Spanish particularly; and, in his forty-fifth year, made himself so far master of the Iroquois Indian tongue, that he wrote and published | treatises in it. In short he became so considerable a person in Boston, that he was several times consulted by the magistrates upon affairs of state; and more than once quelled riots, merely by the force of his persuasions. For the public good, he there planned and promoted several excellent societies, particularly a society for suppressing disorders; a society for reforming manners; and a society of peace-makers, whose professed business it was to compose differences, and prevent law-suits. 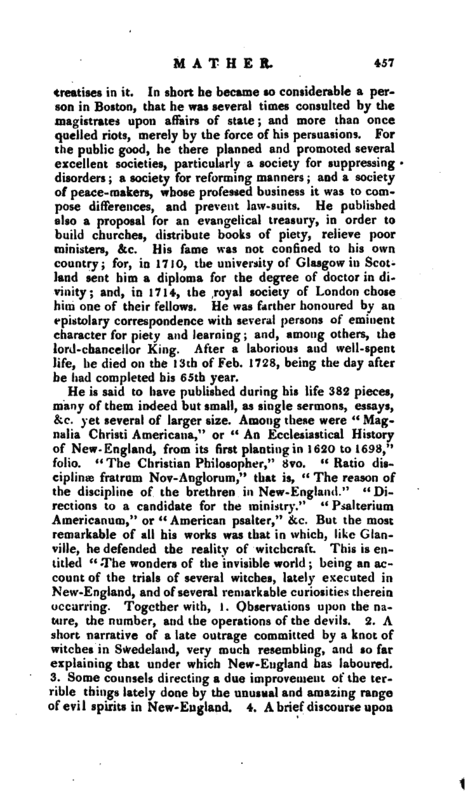 He published also a proposal for an evangelical treasury, in order to build churches, distribute books of piety, relieve poor ministers, &c. His fame was not confined to his own country; for, in 1710, the university of Glasgow in Scotland sent him a diploma for the degree of doctor in divinity; and, in 1714, the royal society of London chose him one of their fellows. He was farther honoured by an epistolary correspondence with several persons of eminent character for piety and learning; and, among others, the lord-chancellor King. After a laborious and well-spent life, he died on the 13th of Feb. 1728, being the day after he had completed his 65th year. He is said to have published during his life 382 pieces, many of them indeed but small, as single sermons, essays, &c. yet several of larger size. Among these were “Magnalia Christi Americana,” or “An Ecclesiastical History of New-England, from its first planting in 1620 to 1698,” folio. “The Christian Philosopher,” 8vo. “Ratio disciplines fratrum Nov-Anglorum,” that is, “The reason of the discipline of the brethren in New-England.” “Directions to a candidate for the ministry.” “Psalterium Americanum,” or “American psalter,” &c. But the most remarkable of all his works was that in which, like Glanville, he defended the reality of witchcraft. This is entitled “The wonders of the invisible world; being an account of the trials of several witches, lately executed in New-England, and of several remarkable curiosities therein occurring. Together with, 1. Observations upon the nature, the number, and the operations of the devils. 2. A short narrative of a late outrage committed by a knot of witches in Swedeland, very much resembling, and so far explaining that under which New-England has laboured. 3. 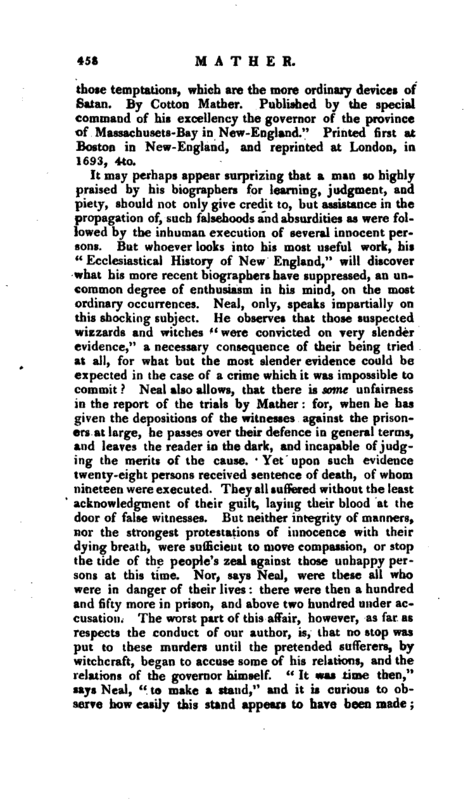 Some counsels directing a due improvement of the terrible things lately done by the unusual and amazing range of evil spirits in New-England. 4. A brief discourse upon | those temptations, which are the more ordinary devices of Satan. By Cotton Mather. Published by the special command of his excellency the governor of the province of Massachusets-Bay in New-England.” Printed first at Boston in New-England, and reprinted at London, in 1693, 4to. Biog Brit. Life by Jennings. 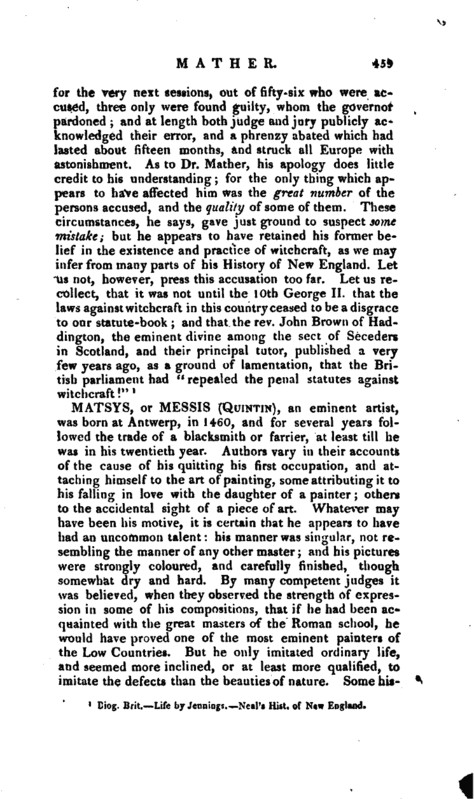 NeaPs Hist, of New England.